The Athens Community Council on Aging is partnering with the national March for Meals campaign by pledging to end senior hunger. 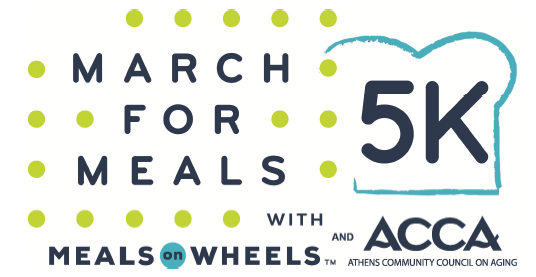 Please join us for the 5K Run/Walk to help end senior hunger in Athens and to support the local Meals on Wheels program at ACCA! Run Anywhere Race Added: NO BLACK BAG POINTS FOR THE ANYWHERE RACE. By popular demand, you can run a virtual 5K this year. Run at your house, on a treadmill, in the park, and at your convenience any time before March 24, 2019. Virtual racers won’t receive overall awards or be placed in the results, but you will receive a bib number and t-shirt in the mail if signed up for that category. Please share your virtual race pictures with us with the hashtag #m4m2019. Race day registration and packet pickup: Begins at 7AM at Creature Comforts Brewing Co. Shirts and Goodies: Shirts are guaranteed to those who register by 3/13/19. Those who register after that date and on race day will receive shirts while supplies last. There will be plenty of refreshments.